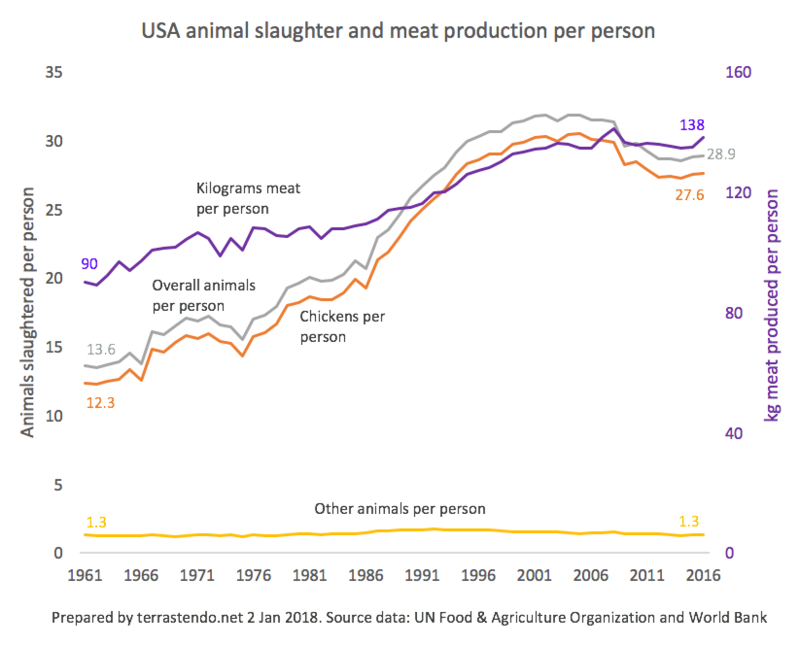 This post highlights some material from this site’s memes and charts page, focusing on animal slaughter and meat production figures from 1961 to 2016. 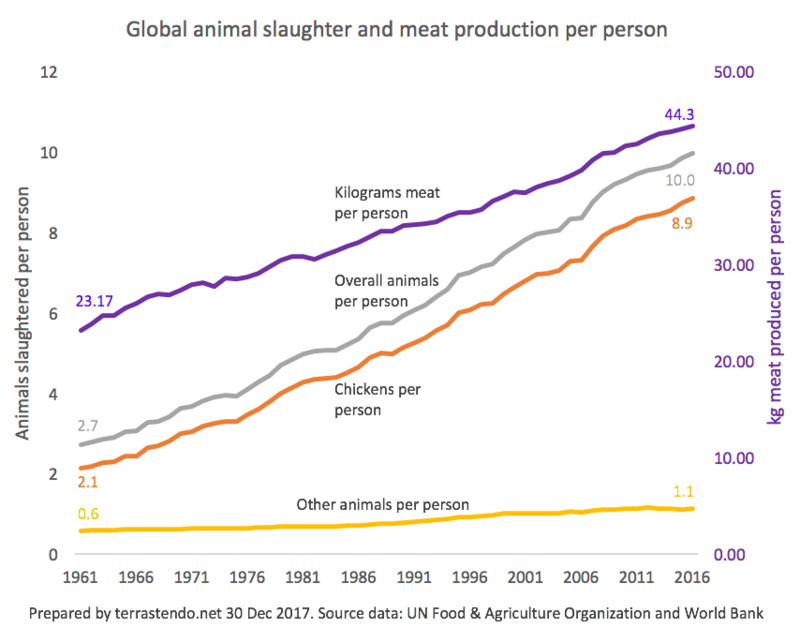 Although there appears to have been significant progress in veganism (from a small base) in many countries, there is a long way to go on a global basis, with a strong overall increase in slaughter numbers over the full period and in recent years. 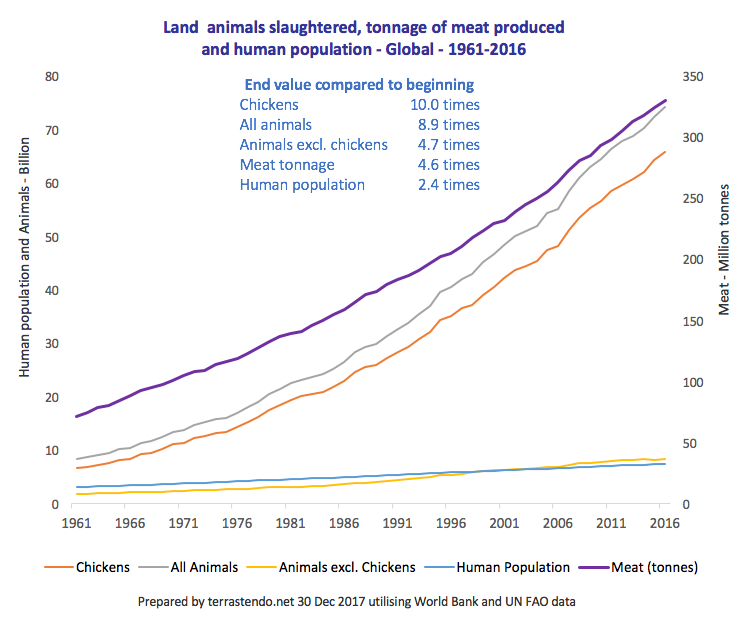 For example, in the ten years from 2006 to 2016, the annual number of animals slaughtered globally increased by 19 billion, or 34 per cent, to 74.1 billion. In 2016, we slaughtered a staggering 2,352 animals per second, on average. The animals paying the highest price are chickens. 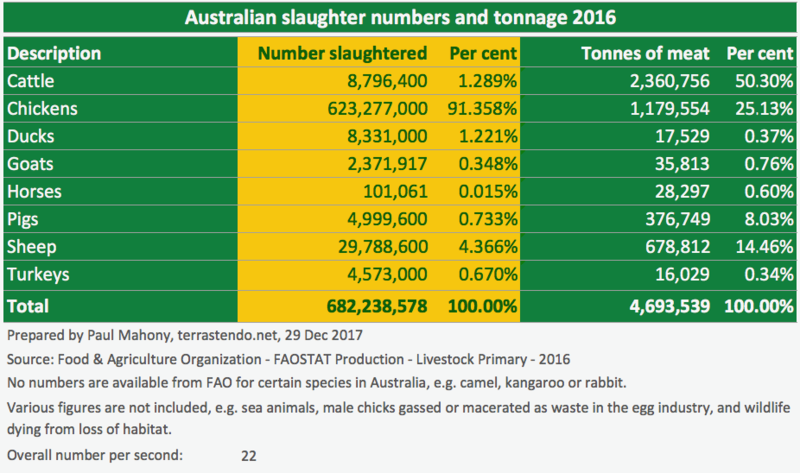 In 2016, 65.8 billion of them were slaughtered for meat, representing 89 per cent of the total. The figure does not include male chicks gassed or macerated (using a conveyor belt and industrial grinder) on the first day of life in the egg industry. As they cannot lay eggs, they are considered waste. 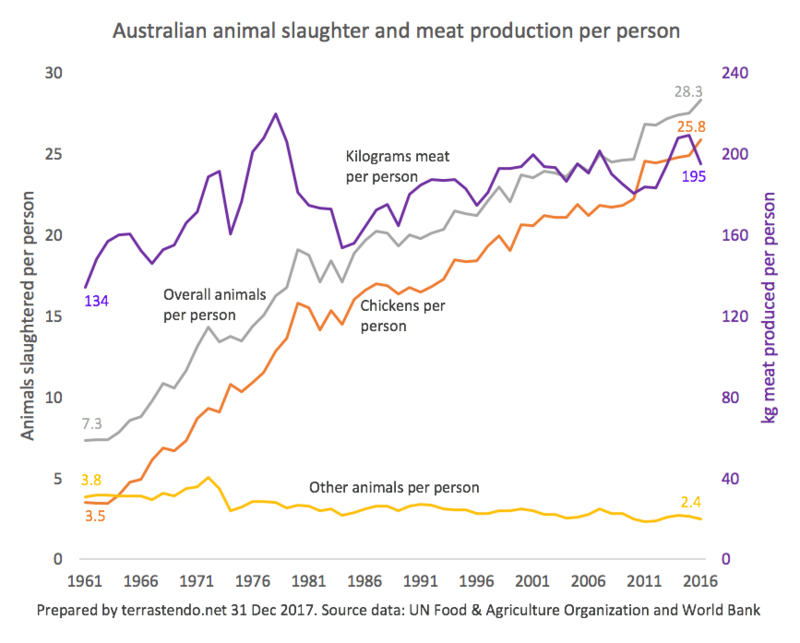 There has been an increasing preference for the flesh of chickens over the flesh of other animals, such as cattle and sheep. 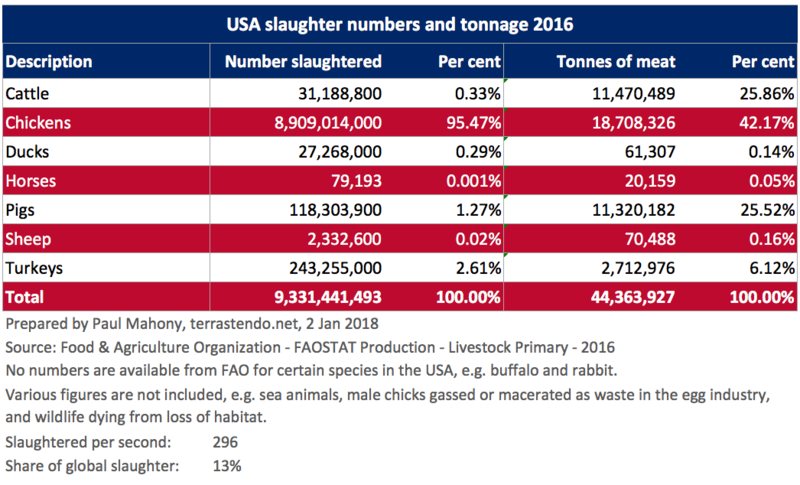 As highlighted in my article, The global slaughter index, anyone adopting such an approach is massively increasing their cruelty footprint. 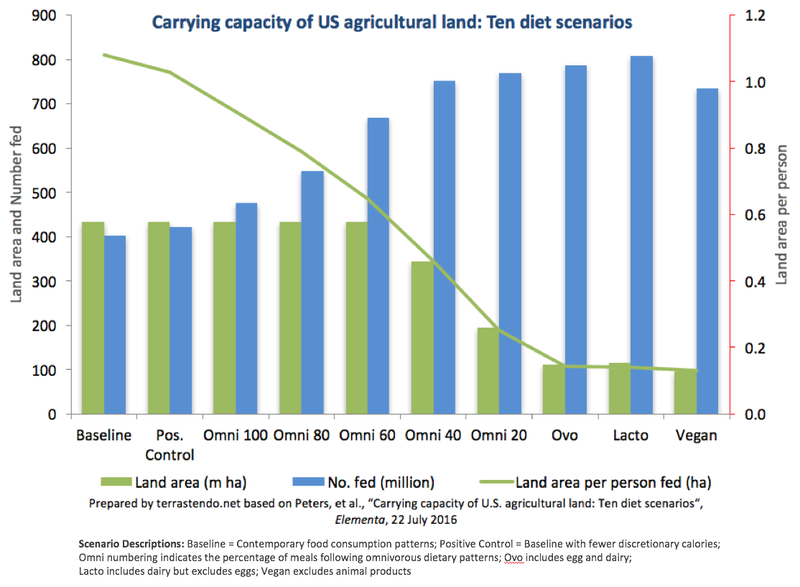 In the USA, 182 chickens are required to replace the meat from one cow. 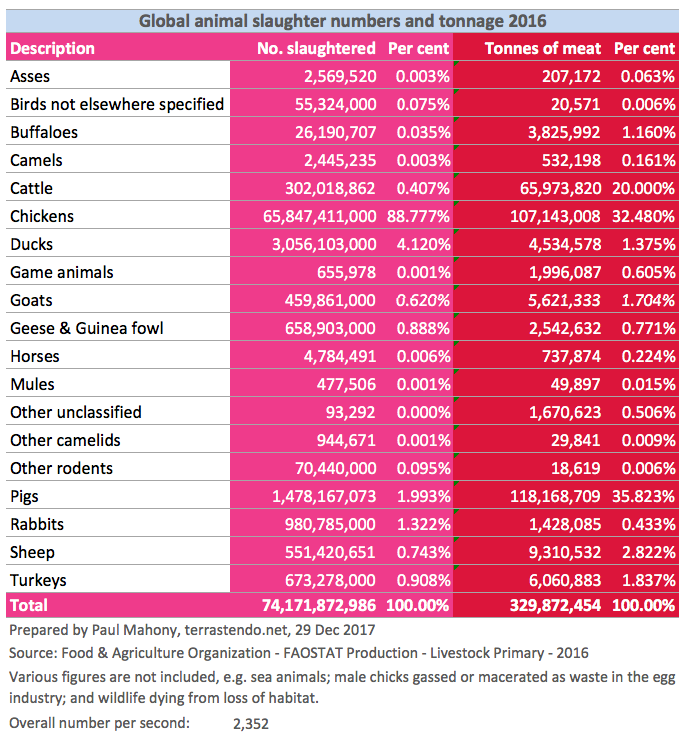 The figure varies by country, and depends on the average yield of meat from each species. In Australia, 138 chickens are required. 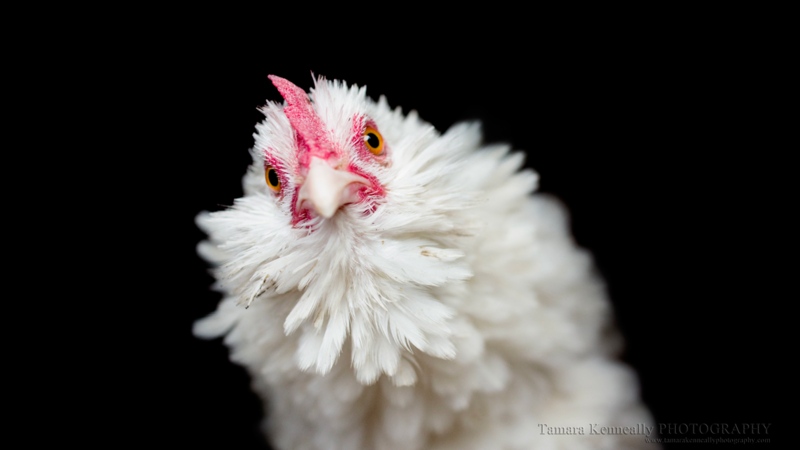 Whether they are a chicken or a cow, animals suffer in almost unimaginable ways. They are regarded by the livestock sector as products or commodities, bred simply for the purpose of being killed. The horror includes legalised and routine cruelty, including practices such as: mutilation without pain prevention or relief; lifelong confinement indoors; and forced breeding with human intervention. By definition, any form of human intervention is unnatural, and livestock production represents an extreme example. Here are the latest figures for the world, USA and Australia. The charts reflect absolute and “per person” figures. We have been conditioned socially, culturally and commercially to ignore the horror that exists behind these charts. They represent hell on earth for animals, but animals are not the only ones paying a price. Animal-based food production is a grossly and inherently inefficient method of satisfying our nutritional requirements. 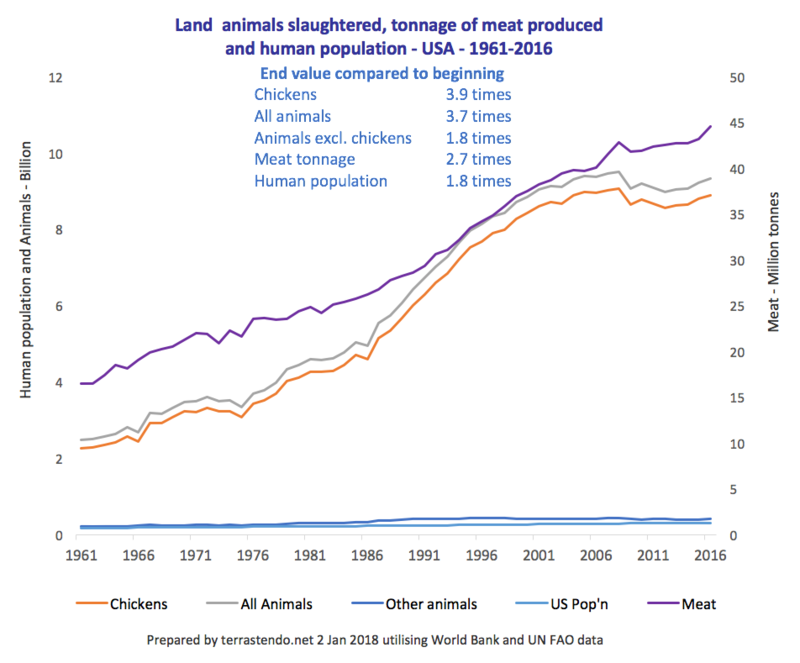 That is a key factor in it having a far greater impact on the natural environment and the existential threat of climate change than animal-free options. It causes us to use far more resources, including land, than would otherwise be required, and is not sustainable on a scale required to feed the masses. 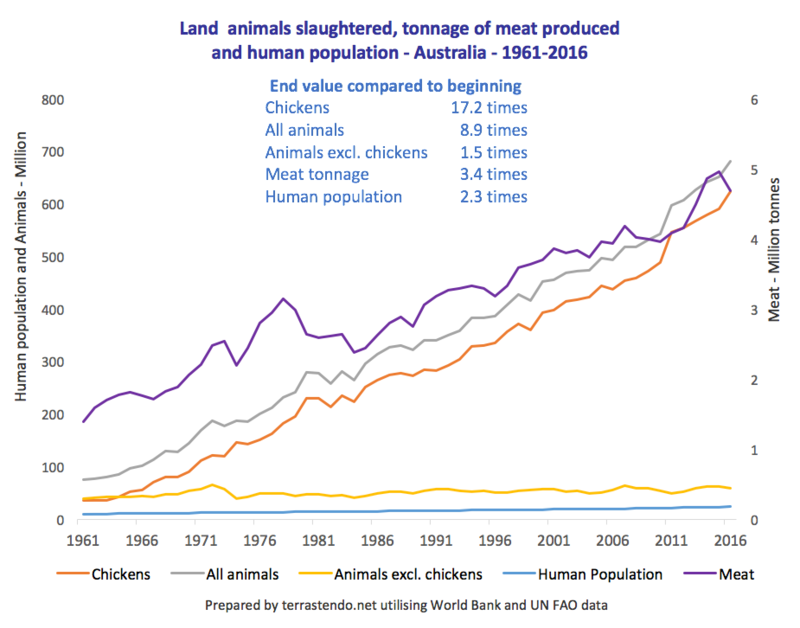 The livestock sector, with the mass slaughter and environmental destruction it entails, may seem like a juggernaut, but the juggernaut can be stopped. Recognition of its massive scale and impact is an essential step on that path. The article was published at 12.13 am on 10th January 2018 Australian eastern summer time, which was 9th January in most parts of the world, including North America.